Sorry for being late in thanking you. I absolutely love this beauty, thank you so much Angel. Hi there and oh so sorry I have not been here. Taking care of Haley while she is on Spring Break and her mom and Dad work. But now I am off Haley watch,(LOL) as she is with her parents for the rest of her vaca. So in the meantime I sure missed being here, making taggies and visiting your pages. Wishing you a great rest of the week, and a beautiful weekend to arrive!! 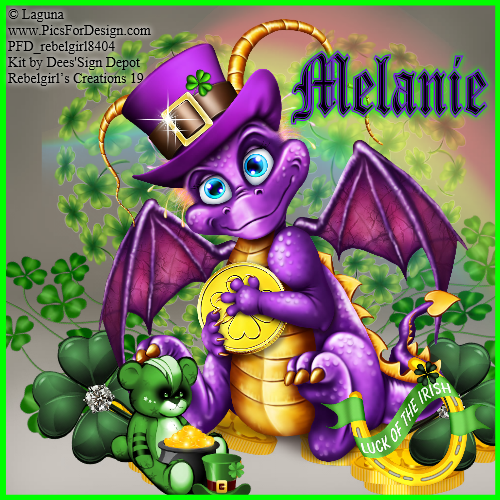 Thank you in advance for tags you have made for me and i will go check out the latest, and A late HAPPY ST. PADDY's DAY to all!! Sorry I missed it!! HUGGSS!! YAY Melanie is back!!! Think happy thoughts girlfriend!! Beautiful your page, love it! Big hugs with love!